This environmental blog introduces Lake Mead, outside of Las Vegas, as an important natural resource for people living in Nevada, California, Arizona, and parts of Northern Mexico. Lake Mead was created when Hoover Dam was built in the 1930s; it is an important source of water and power to neighboring states. Lake Mead is at unprecedented low levels currently, due to increased usage and reduced incoming supply from reduced rainfall and snowfall. Some of the ways this issue is currently being addressed in Nevada include imposed water restrictions, tax credits for desert-friendly landscaping, and a proposed project to build a tunnel under Lake Mead to access outside sources of water. Lake Mead is a beautiful and valuable resource that deserves to be protected and appreciated by residents and visitors alike. When most people think about Las Vegas and its surrounding desert, one of the first things that don’t come to mind is the valuable energy and water resources it provides to millions of users throughout the southwest. Instead, we think of the neon lights, slot machine jackpots, and endless amounts of entertainment which people may or may not remember, or, in some cases, would soon want to forget. But amid the bright lights, there is a hidden gem that makes its presence just outside the City of Sin. It is simply known as Lake Mead. You’re probably more familiar with Lake Mead’s creator – the Hoover Dam. In the early 1900’s, Hoover Dam was built in an attempt to solve the Colorado River’s overflow problem. The construction of the Hoover Dam took about 5 years to complete, starting in 1931 and ending in 1936 (Arizona-Leisure.com; 2015). It took the efforts of over seven thousand workers to complete the project. What developed from the creation of the Hoover Dam was a water reservoir known today as Lake Mead. Lake Mead is over 247 miles in area and covers more than 550 miles of shoreline. Its 1 ¼ trillion cubic feet of water capacity would cover the entire state of Pennsylvania one foot deep (Arizona-Leisure.com; 2015). In this blog, I will give you some reasons why Lake Mead is such a valuable resource, some of the concerns that are going on with Lake Mead today, and discuss many of the efforts going on to sustain, and increase, the level of water that has been lost over the recent years. Lake Mead actually began as a settlement back in the mid-1800s. As time went on, the rising waters from the Colorado River began to force the settlers out and the community became deserted by the turn of the century. So why is Lake Mead such a valuable resource? Many believe that the southwest region of our country wouldn’t have developed without the water and energy that has been provided by Lake Mead. Lake Mead is the water supply for Nevada, Arizona, California, and parts of Mexico (Holden; 1998). Also, with the combination of the Hoover Dam, it’s the primary resource for providing electrical power to Nevada and southern California. About 500,000 homes rely on this power supply (Holden; 1998). Overall, it is estimated that over 25 million users are dependent on the resources that it provides (Holden; 1998). With an understanding of why Lake Mead is important, it makes sense why so many people are worried about the lake’s current conditions. To be able to understand the negative effects, you must first need to know how Lake Mead receives its water intake. Ninety-six percent of the water flowing into Lake Mead comes from snowmelt that drains into the Colorado River (Allen; 2003). The water is first sent to Lake Powell (just north, in Arizona) then into Lake Mead. Water levels are usually at its highest during the springtime, and at its lowest during the end of summertime. Typically you would need a median level of input and output for the process to become successful. Unfortunately for the last several years there has been a shortage of rainfall throughout the west, and the levels of water usage have increased throughout those same years. All of this has sent the water levels at Lake Mead to historic lows. Lake Mead is experiencing some of the lowest water levels in over 60 years (Shine; 2015). With more water going out then coming in, water levels are going down while levels of usage and other problems are going up. When there’s discussion about a drought, usually the word “restrictions” follows. I’ve been living in Las Vegas (90% of our water comes from Lake Mead) now for about 15 years and I can’t remember a time that I didn’t hear about some type of water restriction being in effect. Restrictions are usually designed to not only achieve objectives and results, but to change behavior as well. One of the most common and impactful restrictions in Las Vegas has to do with landscaping care. If you are one of the homeowners who have decided against the rock & sand landscape and have added actual grass for your viewing and recreational pleasure, you will be required to comply with year-long water restrictions. In fact, the city has also implemented such strategies as given tax credit to those with “rock landscape” and has even restricted front yard lawns all together. Much of this is an attempt to change our behavior regarding water usage, but studies have shown that the problem doesn’t solely rely on this. In fact, recent studies have shown that the city has made improvements in water efficiency, using about 40 percent less water per person over the past 25 years (Holthaus; 2014). So the problem doesn’t seem to be solely based on behavior, but rather, that the lake has unsuccessfully been able to accommodate the increased population density that has occurred during that time. In the past 10 years alone, Las Vegas and its surrounding regions witnessed a population “boom.” It might have been great for the economy, but it also has had a negative impact on the environmental resources needed to sustain a consistent living community. With both social and resource dilemmas intensifying, the city has scrambled to put together a formal design to improve the conditions of Lake Mead and to not just solely rely on the other natural resources such as rain and snow to refill Lake Mead. One of the projects that is in development is an artificial tunnel project that over 800 million dollars has been budgeted for, which would run along the bottom of the lake (Holthaus; 2014). The tunnels would be used carry in water from outside resources to sustain the levels of Lake Mead. Many locals are trying to be optimistic that this could be the right solution even though the project has been over budget and past its deadline. And of course, there is limited data available on the success of this type of strategy, so there are no other results with which to measure its success. I have discussed the history behind Lake Mead and why it’s such a valuable resource to many in the southwest region. I’ve also shared today’s concerns and some of the efforts that have been implemented to restore the lake, and get it back to its original form. Not all environmental issues can be solved only with behaviorism; sometimes an alternative solution just has to be implemented. I’m hoping that I gave you a different perspective of what Las Vegas truly has to offer besides an opportunity to accumulate new found wealth, new found debt, and/or a new found two-day hangover. The next time that you plan your trip to Las Vegas, I invite you to give yourself an opportunity to stand up from the gaming tables, step outside the casinos, and take a trip to see Lake Mead- really one of the true wonders of the world. If America is in fact the land of the free, why should Catholics have to compromise their beliefs on reproductive rights? Many biologists believe that pronatalism, the belief that there should not be a limit on the amount of children one wishes to bear, is an outdated belief that leads to disastrous effects on the ecosystem (Pennsylvania State University, Fall 2015). Those in favor of the overpopulation theory believe that humans consume an excessive amount of the earth’s natural resources and bring destruction to natural habitats. Their solution to these issues is to control population size, especially through birth control methods (Pennsylvania State University, Fall 2015). Consequently, the problem lies not so much in the size of the population, but in how the population interacts with the environment. Because Catholics believe children are a blessing from God, those who follow the teachings of the Catholic Church are pronatalists and cannot support population control interventions. Though Catholics cannot participate in the effort to reduce population size in order to lower natural resource use and pollution of animal habitats, they can teach their families to properly use the resources God has bestowed on them. Based on the teachings of the Bible and the Catechism of the Catholic Church, God should determine how many children a couple brings into the world; therefore, Catholics can help preserve the environment and its resources by reducing their carbon footprint and treating the environment with respect. The Catholic Church’s system of belief is based on a combination of scripture, the Bible, and tradition, the Catechism of the Catholic Church; both of these elements oppose methods of population control. In the first chapter of the Bible God commands the first man and the first woman to “be fruitful and multiply, and fill the earth, and subdue it; and rule over the fish of the sea and over the birds of the sky and over every living thing that moves on the earth” (Genesis 1:28, New American Standard Bible). 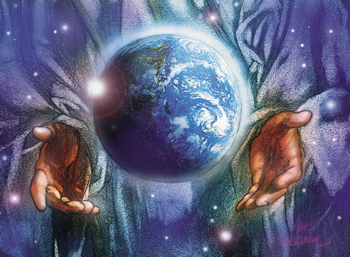 Not only did God command man to procreate, but He indicates that humans have the responsibility of caring for the natural resources of the world. In addition, the Catechism of the Catholic Church teaches that every intimate act should be within marriage and open to the possibility of life (Catholic Church, 2353 & 1664). The use of contraceptives as a means of population control are thus prohibited by the Bible and the Catechism of the Catholic Church. Not only does the Catechism promote fruitfulness, but it commands justice and charity in the care of natural resources (Catholic Church, 373-378). From this belief it is required for Catholics to try to reduce their use of energy and care for the environment. Catholics can reduce their carbon footprint by adopting good habits in regards to automotive and electrical use (Carbon Fund Foundation, n.d.). Carpooling and investing in fuel-efficient cars are optimal ways of lowering ones carbon footprint. Furthermore, installing solar panels and insulating one’s home can reduce energy consumption (Carbon Fund Foundation, n.d.). In regards to caring for the environment, Catholics can help this movement by donating to habitat conservation efforts like the National Wildlife Federation (National Wildlife Federation, 2015). Avoiding pollution and always recycling can also help preserve natural habitats (United States Environmental Protection Agency, 2015). One glass bottle made from recycled glass can reduce air pollution by 20% and water pollution by 50% (Conserve Energy Future, 2015). Imagine the positive impact on animal habitat that would result if all Catholic families committed to always recycling. The most humane way to reduce natural resource consumption and destruction of habitat is not by eliminating humans but by modifying human behavior. There are ways other than population control that humans can embrace to help protect the earth’s resources and wildlife. Catholics in general cannot support the idea of population control as an adequate means of reducing natural resource usage or protecting animal habits. Reducing energy depletion and protecting the environment are effective ways that Catholics can help the earth. Non-Catholics and Catholics alike are called to make a firm effort in preserving the earth that they share. Catholic Church. (2012). Catechism of the Catholic Church. Vatican City: Libreria Editrice Vaticana. Environmental issues are at the forefront of a lot of people’s agenda, especially with the upcoming elections. College campuses such as Penn State University Park are making the proper changes to make it easier for students to reduce, reuse, and recycle without even thinking about it. I am such a huge proponent for sustainability causes, mainly because it can be accomplished so easily. In 2014 the National Recycling Coalition (NRC) gave Penn State the “Outstanding Higher Education Award” (National Recycling Coalition names Penn State ‘Best of the Best’) and last year alone of the 14,163 tons of solid waste we produced, 7,991 tons (56%) was diverted from landfills (Recycling and Composting). With the growing fear of the impact of global warming and societies ability to reduce methane production while also helping the community sustainability is a widely growing field of interest. Since my freshman year at University Park in 2011, I have seen the incredible changes that the school has been making and the impact these changes have had on the students. I have seen the campus grow from having just one recycling can in the dorm rooms and simple can and bottle recycling in the dining areas and the HUB, to this year completely ridding the campus of polystyrene (Styrofoam). In 2015, University Park has taken several steps to making campus a sustainable environment. 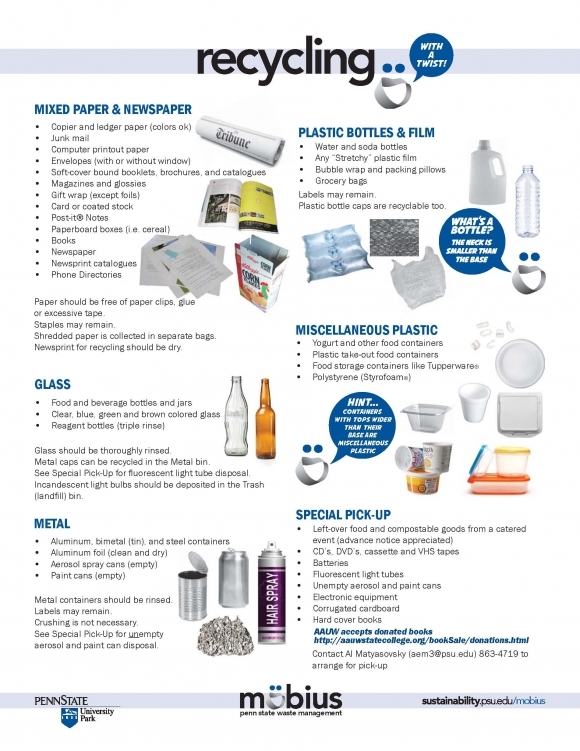 Instead of having just one recycling option in all the buildings on campus, there are now options for composite, glass, plastics (different subgroups which are specified on all of the containers), and paper. Not only does this promote recycling by almost forcing it, but it also educates with descriptive signs detailing which plastics are which. The lights in most campus buildings have been switched to more efficient LED lights that last longer, take lower wattage, mercury free, and cost effective (Energy Efficient Lighting). They are also motion activated to turn on and off when people exit or enter the room which yields 34% less energy than comparable buildings. The toilets in almost all the buildings are now also reducing the amount of water used for every single flush by 16.67% (Smeal LEED Certification Process). There are several other sustainability initiatives taking place on campus like both interior and exterior features (native and/or adapted vegetation, storm water management, daylight and central staircases), sustainable purchasing and waste diversion, green cleaning, and other practices outlined in U.S. Green Building Council’s LEED (Leadership in Energy and Environmental Design) certification process guidelines. My favorite new initiative applied this year is the elimination of Styrofoam from the South eating district on campus. Last school year alone, South eating commons used 279,400 Styrofoam containers (Penn State On Campus Living – University Park). That is only one of the eight eating establishments on campus. 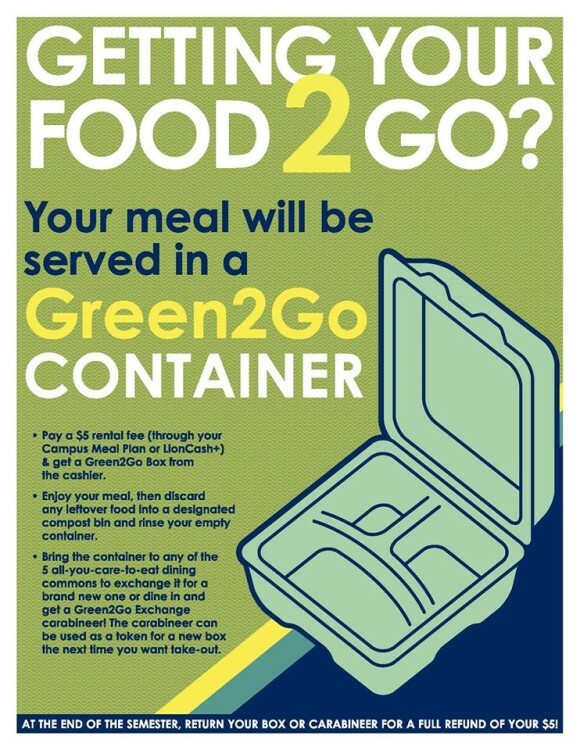 The new system gives customers a reusable Green2Go box that when returned 10 times warrants a free meal. If you do no return it, the individual is charged $5 until returned. If implemented throughout the campus, this could greatly impact and reduce Penn State’s footprint, all while setting an example for campuses throughout the country. This is just the beginning of a long process to make our planet healthier and will take the participation of communities everywhere. Attitudes about recycling need to be more positive rather than viewing it as a chore. Positive attitudes will result in positive behaviors. Poverty does not receive the same amount of assistance or emphasis as HIV. In fact, discrimination, fear, and alienation of the poor is normative and recommended; while the same behavior is prejudice to HIV victims. Poverty attacks the mental, physical, and financial abilities of a being, right down to the point of defeat. Poverty is a cancer of societal function, and if unable to function in a society, while too poor to change locations, people fail to survive. The same internal aspects plaguing the T-helper cells, is occurring in our societal system. The human immunodeficiency virus attaches to cells of the body and replaces its’ RNA into the nucleus, thus creating more of itself. Wealthy or better-off citizens buy low income property, rearrange the culture and increase the cost of living, and rapidly replace areas filled with the poor. This process of gentrification comes without warning or notice. There are also no preventative methods. Since this is so, how is it that HIV receives major recognition and aggressive assistance, while those in poverty hang at the wayside? There are two primary reasons: The causes of poverty are stigmatized and not well understood on a societal level and because there is a societal focus on health being solely physical and of biological origin. Health psychologist and applied social psychologist can intervene in the way we view health and how we promote effective measures in societal treatment of poverty. The effects of HIV, just as well as the cause, are considered with great significance and importance. People can identify the routes of transmission and the effect on the body easily. What is not understood about poverty are the causes and effects. Lack of financial resources prevents obtaining adequate health care or housing opportunities. As a result of living in a poor neighborhood, it is likely for crime to occur (Garbarino, 1976). There is a greater risk of theft, vandalism, and assault attached. For younger children, this is very detrimental to their development and can counter the positive values taught in the home. Younger children are educationally impacted, as their parent(s) is unable to afford private or higher quality schooling, they will be forced to accept the often-times terrible public school system nearby. But what causes this all? How does it get to this point? For minorities, it may be a generational factor. The effects of discrimination are not just instant and immediate to the ones who experienced it firsthand. It is continued through familial ties, with the family who faces discrimination being disadvantaged from opportunity exclusion even after new generations arise. Poverty may be a natural result of regional opportunities. Take Baltimore for instance, what was once a robust industrial city, is now facing great unemployment and poverty in many areas. Exportation of factory jobs and the move from industrialized jobs left the economy devastated (Vicino, 2008). Now one-quarter of the population lives in poverty (Kilar, 2012). Whether a result from internal or external factors, it is imperative to acknowledge the cause of poverty when assessing for treatments. Rather than taking a dismissive stance or negatively stereotyping the poor as lazy, uneducated, immoral people, it is better to rationalize the entire experience of not having resources. As health and applied social psychologist, health screenings on stress-induced disorders, informational sessions about proper emotional-behavioral responses, and training workshops on social skills and life skills should be incorporated into the efforts to reduce the symptoms of poverty. Mental health has become a recent concern with the politicizing of gun usage and homicidal attacks. Prior to, mental health has had a difficult time receiving any attention. This may stem partly from the ignorance to the psychological effects on physiology or vice versa. Pseudo-psychology such as tarot card readings and palm readings, have not helped psychology’s plight in being taken as a serious science either. Because mental processes are not tangible, many fail to exclude their responsibility in specific outcomes. Applied social psychologist and health psychologist know how important these processes can be. Tackling why people don’t take better protective measures to avoid HIV transmission can lessen the incidence of the disease. Creating advertisements and confidential question hotlines for at-risk populations may decrease the societal prevalence of HIV also. As stated previously, the cause and effects of poverty aren’t as well understood as HIV. Since this is so, it is much more difficult provide precaution and advice on prevention and treatment. The population at hand must first be introduced to the psychological foundations integrated into poverty. Feelings of hopelessness, psychological burnout, depression, and anxiety are all possible symptoms of poverty (Winer, N.D.). If these are ignored, it is likely a snowball effect could take place, and complete emotional burnout develops. Not only are our mental states effected by this stress, but our bodies as well. Psychological stress prompt the body to release stress hormones such as epinephrine and norepinephrine (Sapolsky, 2004). Overtime, this stress response wears the body down. Metabolic disorders like diabetes, or even hypertension, or gastric ulcers will develop (Sapolsky, 2004). To tackle the health implications those in poverty face, efforts must be made to challenge the current understanding of health. Workshops explaining the interaction between emotion, behavior, and health so that people can understand how to control their emotional and behavioral responses to cope with stress. Training should also be given that includes a biopsychosocial approach to preventative healthcare. Summarily, poverty and HIV prevail under the same conditions. Lack of proper insight on the cause and effect propagate their advancement and hinder progress in treatment. Poverty, though not considered along the same lines as HIV, has specific symptoms and signs, an affects all or part of an organism’s functioning. Poverty is very much so a disease. As an applied social psychologist and as a health psychologist, measures can be taken to improve the status of citizens facing both diseases. Tackling the lack of knowledge on poverty, increasing awareness of the biopsychosocial context of poverty, and emphasizing available community resources are all areas that both psychologist may include. The aim remains to challenge a brutal cycle and alleviate future generations from experiencing the perils of HIV and poverty both. Keniston, K. (1979). Do Americans really like children? In D. G. Gil (ed. ), Child abuse and violence (pp. 274-285). New York: AMS Press. Garbarino, J. (1986). Can Americans afford the luxury of childhood? Child Welfare, 65, 119-128. Vicino, Thomas J. (2008). Transforming Race and Class in Suburbia: Decline in Metropolitan Baltimore. New York: Palgrave Macmillan. ISBN 9780230605459. Sapolsky, R. M. (2004). Why zebras don’t get ulcers. New York: Times Books. The uncertainty of the long term effects that our decisions and actions have on the environment make it easy at times to rationalize behaviors that one knows could and probably will be detrimental in the long run. Personal gratification is often chosen over the consideration of whether this action or behavior will have long term effects, over the environment and sustainability. This tale of two choices is what is known as a social dilemma (Schneider, Gruman, & Coutts, 2012). When discussing interventions that could aid in conservation of certain resources in our environment, it is often been discussed at a micro level, however one cannot help but consider the bigger picture of the resource dilemma. Society as a whole seems to fall into the social trap of indulging in short term pleasures, often without considering the long term effect it has on the environment and the future sustainability of our planet. Recycling is a great way to help the environment, as opposed to not recycling. Yet, does one ever stop to question why do we have so much recycling? Consumerism has a huge effect on many aspects of our environment and the degradation of it. With society’s insatiable appetite for the latest restaurant, toy, video game, technology, cars, and cell phones, there is not enough room for all the things that we eventually throw by the waste side. It has been said that American’s consumption is higher than anywhere else in the world (Mount Holyoke College, 2015). Not to mention the mass amounts of resources that are necessary to produce and process these goods: land, water, trees, and fuel. Environmentally, to create these products there is a great deal of pollution and byproducts that are involved with manufacturing. Forests are being destroyed, the ozone is diminishing, water supplies are being depleted and polluted, global warming is occurring, the lands are eroding and we are running out of land in general. Consumption patterns must be changed, but that would be a major undertaking. This is not a topic that is heard of as often as the other areas of environmental concern. Perhaps, this is for a few reasons. First, our economy is heavily dependent on our consumerism. One must remember that economic growth is measured by the gross national product (GNP), which is “the sum total of goods and services produced by a given society in a given year” (Shah, 2005). It is a vicious cycle. One must consider that the system seems stacked against the change of these consumer habits. For instance, technology is made with planned obsolescence, to ensure one needs the latest and greatest or we are automatically at a disadvantage or disconnected. Second, our consumerism is indicative of our social status. If one has the original iPhone, they may be asked if a quarter is necessary to use it. There is shame associated with anti-consumerism. This indeed is a sign our perspective about the need for things may be skewed, as the need for them might just be our planet’s demise. This tragedy of the commons will eventually lead to a very unpleasant circumstance if change does not occur in the immediate future. While efforts on recycling and conservation are certainly commendable, the challenge is to address the bigger social picture and the bigger system that is reaping rewards while wreaking havoc on the planet. Perhaps the best form of intervention would be knowledge. For example, mandating environmental science in the curriculum at the secondary level of school would be a start. Although, the easiest thing to do is to rationalize that everyone is a consumer, that it’s necessary for the economy, and that one person won’t make that big of a difference, this resource dilemma must be thought through by each individual if change is ever to occur. This change must be of a social nature and possibly with some better government regulation. To see one’s environmental footprint in everyday decisions National Geographic has an excellent educational interactive site up. It is definitely worth checking out! There is a great video out on the whole process behind consumerism that presents the real picture one cannot ignore after watching. Schneider, F. W., Gruman, J. A., & Coutts, L. M. (2012). Applied Social Psycholgy: Understanding and Addressing Social and Practical Problems (2nd ed.). California: Sage Publicationss. In my family group, we attempt to leave as small of a carbon footprint as possible. Teaching lessons in conservation and protecting our resources is rather important. With this said, I found myself in quite a dilemma the other day while driving to the store with my seven-year-old son. Son: Mommy, what is the black stuff coming from that truck? Me: Well, it depends on the truck as if it is a diesel truck, it is the “normal” exhaust. If it is a gasoline truck, it could be an issue within the engine. Me: Yes, it is bad for our air. It is called pollution. Remember? We have talked about pollution and you learned in class. Son: I remember. Why can’t we tell the person they are wrong and to stop? How does a parent explain to their child that you cannot simply walk up to another and inform them they are polluting the air we all have to breathe? Life does not work in that manner nowadays. However, when you think about it the way my son did, someone should in fact make a comment to the individual. Too many individuals today are so nonchalant when it comes to the limited resources we have on Earth. I am not sure if it is simply for the reasons they do not care or if they are not informed. It reminds me of trying to persuade an individual to be energy conscious or to recycle. One cannot be forced, they must understand the benefits and have desire to make a change. The social dilemma here is too many individuals are not venturing to make a change. Many times an electric car limits the individual to short driving, i.e. staying in the town they reside as there are not areas for them to charge. When it comes to recycling, all too often smaller towns do not have a recycling program (such as the town we reside) therefore if an individual desires to recycle, they must drive a few towns away. Whether it is simply for the reason that electric cars are not feasible or implementing a community/city wide recycling plan is too costly, the problem will not change until someone or group begins the process. Many groups have come forward over the years to inform the public of the many issues we can face down the road if change does not happen soon. At times, individuals hear what is being said and decide this is something they want to do, although they are unsure how much time, effort, or even money it will take to contribute to the campaign. If they do make the decision, they may begin the campaign, stick with it for some time, but then stop as they are becoming overwhelmed with the extra effort they are giving when they do not see others doing the same. Our environment has given the individuals of this world so much bounty; however, this bounty will not last forever. It is time to stand up and make a change. It is election time in many local communities, therefore, make the issue known and see that change is made. Resource dilemmas have been the source for struggle between mankind that has occurred throughout history, but now, instead of resource shortages being confined to a particular geographic area these dilemmas are now related to a global scale. As populations continue to increase and resource shortages continue to grow, human behavior will react to these shortages to the extent that previous core belief systems will change in order to accommodate the need for survival. China implemented a one child program in order to answer the problem of overpopulation. “China has the highest population in the world, encompassing 1.2 billion or twenty one percent of the world’s population (P.R.B. 7)(Cook, 1999).” This program has decreased population growth but has not been successful in reaching goals necessary and is not without serious consequences. Infanticide has been one of the consequences of the one child program instigated in China. Infanticide has been practiced throughout history. Societies whose cultural belief systems, that include infanticide, placed little value on an infant’s life if the infant served no future value for society and infanticide was a widely accepted practice within these cultures. While overpopulation does present a variety of problems for the world’s sustainable resources, the solutions to overpopulation must be studied responsibly and scientifically by applied social psychologists as to how these solutions might affect human behavior and cultural perceptions, social facilitation, and in turn how human behavior might react to these solutions producing negative or positive outcomes. I was recently listening to NPR where they talked about the amount of trees that were in the world. Immediately, I thought, well there are a lot of trees in the word! I guessed maybe a couple hundred thousand trees. A couple of years ago, Thomas Crawther was inspired to take a census of all the treats in the world. He was working with a friend who wanted to undertake planting 1 billion trees to fight global warming. But because they didn’t know how many trees there really were in the world, they didn’t know if this would make a difference at all or if it would change our world for the better (Greenfieldboyce 2015). Not many people have done research on the quantity of trees in our world. One estimate was that there were 400 million trees world wide (Greenfieldboyce 2015). So using satellite imaging and meticulous data collection spanning over 2 years, we now have been given a number. Are you ready… there are 3 TRILLION trees in this world (Greenfieldboyce 2015). Now, that is a very large number. So my thoughts automatically went to the idea that we are fine, global warming is not a big deal, because we have so many trees. One Sunday when I was visiting my mom in Conyers, Georgia I noticed that one of the woods areas where we used to hang out when I was in high school was torn down and there was a Publix, Target, AT&T and restaurants all over the place. There were so many trees there, that are all now gone. So, this is the dilemma: We keep cutting down trees to build more and more buildings because we have more and more people occupying this earth. It is estimated that 15 billion trees are cut down each year by people to make space for our growing population. The earth isn’t getting any bigger to accommodate all of the people it is housing. Data suggests that in 300 years, there will be no trees available. What will we do then, how will we breath, what will our world look like? How can we realistically fix this population problem and keep the trees we have now? Crawther and his colleagues want to now plant 1 trillion trees based on this new information. But planting so many trees won’t happen over night, it will take years and years for these trees to be planted (Greenfieldboyce 2015). There are many environmental issues that are prevalent in today’s world, not the least of which include water conservation, better use of natural gas and electricity, curbing air pollution, and global warming. One issue that I feel many people can control immediately is recycling. It may be a small contribution but one that has an immediate and major impact on our nation’s landfills. I can recall, in my youth, a time when bottles were returned for a nickel a piece and people would collect tin to sell at some unknown “yard” for pennies a pound. I am not sure why this policy went by the way side but it was a concept of recycling that should have been continued. When plastic bottling came about in the seventies, there was no recycling. These plastics were not made to be recycled. Everything went to trash. Many other products used in homes went directly to trash yards as well and our landfills started to become overfilled. It was not until 1991 when Coca-Cola came out with a recyclable plastic bottle. ” Recycling efforts will get a boost in 1991, when Coca-Cola introduces the first recycled-PET soda bottle. PET recycling will grow from 8 million pounds in 1979 to 622 million in 1995.” (A Brief History of Recycling. Motor City Free Geek. Retrieved from http://www.motorcityfreegeek.net). Awareness of landfill issues become more prevalent during the nineties and more people start to take recycling efforts seriously. The National Resource Defence Council reports that our nation currently recycles 32.5% of our trash compared to 5% in 1970 (Recycling 101.National Resource Defence Council. Retrieved from http://www.nrdc.org). The efforts of Applied Social Psychology’s Cognitive Dissonance Theory could possibly have been what caused this action to take place. Believing that we need to recycle and actually doing it are two different things and could cause that struggle within each of us if we do not do our part. Awareness campaigns along with reports of a bleak future for our children if we do not recycle have moved many Americans to action. Recycling is a large part of our communities. It takes little effort but helps in such a major way. It has become a normal part of my life. It’s the least I can do for the environment. Applying social psychology to environmental issues is a unique and interesting twist on altering problematic behaviors. Although I saw the value in changing perception in other ways, I never really thought about it in this context. Since this week’s lesson focused on different strategies used for recycling, energy conservation, and reduction of water usage, I wondered how this applied in my everyday life. In what ways are utility companies, businesses, and even my employer effective in discouraging wasteful behaviors? To learn of the answer, I decided to become environmentally aware of practices in my home, of local businesses frequented, and my work environment to find out. Purchasing a fully electric home, I anticipated my electric use to be a bit on the higher end. After all, attending school online uses energy, as well as cooking, using hot water, air conditioning, heating, etc. So it came as no surprise to see my monthly usage for the square footage of my home. What was shocking and made me take notice, was after receiving a home energy report that showed astronomical usage compared to other homes in the area. This detailed report showed the times of peak usage, an average day of the previous month, usage of similar homes, homes that are both similar and efficient, and my home in comparison. If you are found to have a good rating, one “smiley” face is received and for great, two. My first report showed that I was well behind similar homes in the area, but this changed after a few months when the rating of good was received and later great. While I did not think such awareness would have this type of impact, I am pleased to say that it did and I am more cognizant of my usage. Schultz et al. (as cited in Schneider, Gruman, and Coutts, 2012) saw similar effects in their study of home energy conservation. The researchers found when a report of energy consumption was given that provided a comparison of usage and a smile or a frowned face as the “…injunctive norm of approval or disapproval,” households responded by using less energy (Schneider et al., 2012, pp. 309-310). Besides energy consumption, waste is yet another area that garnered little attention – until I noticed the “face-lift” many trash receptacles received. During lunch time in downtown D.C., I frequently gather with co-workers or friends to grab a salad, chicken roti, or whatever may seem tasty for the day. Usually when our meals have been completed, the fast food establishment offered large trash receptacles to discard of all remaining items. However, this is no longer the same. Over the past few months, I have noticed that the trash cans are not just one large bin anymore. Restaurants now have containers that divide the different type of waste for recycling purposes. Since everything cannot fit into certain squares or holes, the consumer must be mindful of how to discard the trash. Although I am not certain how the trash is handled from there, this method of sorting has rolled over into my home life. By being mindful of the way trash is discarded in restaurants, I am aware of the same processes at home and have set up separate areas for different items (plastic, paper, etc.). I have also started to reuse plastic bags, bottles, or anything that can be used on more than one occasion. This helps me to participate in the recycling efforts in my community and make a small step towards helping the environment. Since so much time is spent in the office, it was pretty interesting to look at behaviors encouraged by building management and my employer. Upon entering the building, visitors/workers are introduced to the stance building management has taken with respect to sustainability. Logos of Energy Star and the U.S. Green Building Council are affixed to the entrance and are very visible. This relays the message (at minimum) that the building is energy efficient, conserves water, and participates in recycling efforts. In testing this assumption, I stayed attentive to ways the bathrooms were designed, trash practices, and energy efficiency products. Within my office, there are various containers for paper, plastic, and general trash, then others for paperwork that requires shredding. While my employer has provided all energy efficient laptops/computers and equipment within the office, the building has also taken steps to ensure compliance is met. For example, if an office is unoccupied for a certain amount of time, the light automatically turns off. This helps to reduce usage when others forget or fail to turn their lights off when departing for the day. When looking at the restroom, I noticed low-flush, manual toilets and hand towels made from recycled paper to dry our hands after washing. Our rooftop terrace, which provides amazing views of the city, boasts of greenery that provides some comforts of a park setting and allows tenants to gather for lunch, social functions, or just a moment enjoy the view. Trash practices are prominent here also, where much like my office, there are containers for plastic, glass, etc. that is separated for recycling. All in all, applied social psychology is all around us and with respect to the environment, there are practices being used every day. Although we may not be aware of its effects, the trash separation at fast food restaurants and my office carry over into my home and it helps with community efforts. Likewise, my utility company implemented a program that has proven successful in studies and now in several homes within the area. While we may not always be mindful of such behaviors, it is a pleasant thought to see how it has helped curb some of my bad habits. Have you noticed the same in your environment? Try taking an observational tour to find out. You will be surprised at what you discover. Schneider, F., Gruman, J., & Coutts, L. (Eds.). (2012). Applied social psychology: understanding and addressing social and practical problems (2nd ed.). Los Angeles: Sage.